DeVina Earth Moss was too young to remember her parents’ divorce, but she recalls how it affected those around her. Her mother fell into a deep depression, although this did not stop her from throwing herself into work to support the family. Moss’s older brother began acting out and getting into fights. Yet, despite the difficulties of the period, Moss gleaned an important lesson from watching her mother endure the divorce: a woman does not need a man to survive. Years later, as a teenager, Moss began to clash with her mother. She was too demanding, too controlling, Moss said. She would require Moss to take care of a younger sibling and manage other household chores while she disappeared for days at a time. It got so bad that Moss’s older sister, then a high school senior, became the main force keeping the family together. Finally, fed up and aged 15, Moss left home to live at a friend’s house. She cut off contact with her mother. Six months later, a social worker approached Moss to say that her younger sister had been taken away from their mother. In fact, officials had no idea where Moss herself was, finally tracking her down at school. Moss was placed with a foster family in a very different neighborhood of her native Des Moines, Iowa. Here again Moss took valuable lessons from her new foster parents. Married for a quarter century, Moss’s foster mother never took her husband’s last name. What’s more, she had the more prestigious job and the higher income. As Moss put it, people in her foster mother’s circle “know her for herself.” Once again, Moss could see that a woman’s happiness and success need not depend on her relationship with a man. Over the next two years, Moss sought opportunities to exercise her own growing sense of power and independence. She got involved in women’s rights activism. Following Donald Trump’s inauguration, she took part in the Des Moines chapter of the 2017 Women’s March. Her latest move has been to spend four weeks in Costa Rica with The Experiment in International Living, spending her first time overseas exploring a profoundly different country than her own. Now 17, Moss said that she recognizes echoes of her own experience in the Costa Rican women (or “Ticas”) that she meets. 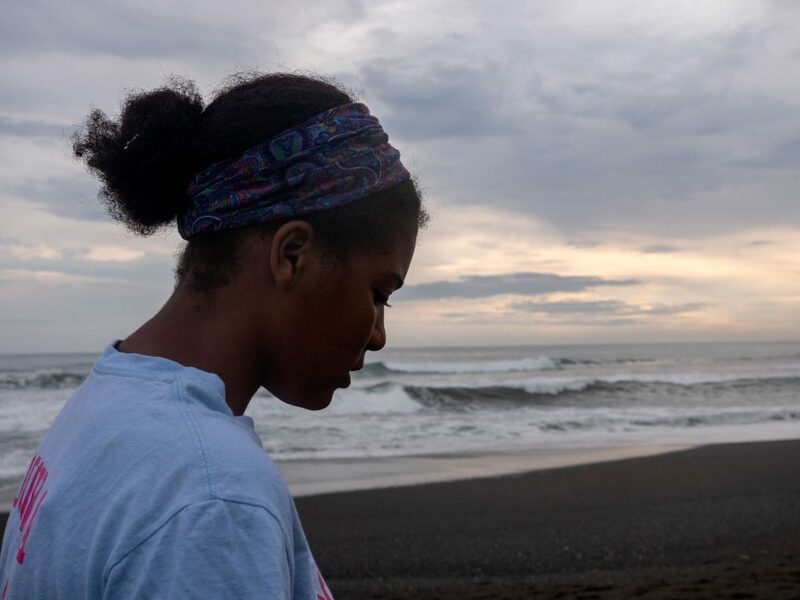 Following a two-week homestay, her group traveled north and crossed the Gulf of Nicoya in a dilapidated water taxi to remote Chira Island, home to some 3,000 people who survived in the past by fishing the surrounding waters. Today, overfishing and climate change have reduced local fish stocks to the point that residents of the island have been forced to devise new ways to make a living. On Chira, Moss’s group of Experimenters stayed at Posada Rural La Amistad, a women’s collective that has pioneered a range of enterprises to sustain their community. One of these, ecotourism, the Experimenters took part in directly, staying in rustic cabins nestled deep in the island’s tropical dry forest and eating meals that the women prepared three times a day. The group toured the collective’s other initiatives, among them mangrove conservation, mussel farming, and the production of artisan crafts for sale to visitors. The women explained that they had won international grants to support both their work and community institutions like a nearby school. Yet, Moss learned that the island’s response to the women’s efforts has not always been positive. The collective upset the traditional balance of power between men and women on the island, shifting economic clout away from the island’s fishermen. Some men responded with hostility. Some of the women’s own husbands refused to help them launch projects, leaving the women to undertake tasks like cabin construction on their own. In the women’s perseverance and success Moss could see shades of her mother and foster mother. Moss said that Costa Rica has presented her with unique challenges. During the homestay near the southern town of La Palma, she learned that a friend at home broke his neck diving into a pool and was paralyzed. Another childhood acquaintance lost his infant daughter. After receiving these grim bits of news from home, Moss felt the pull of an old self-care technique: to retreat into her room for hours at a time, alternately sleeping and listening to music as though hibernating in a cave of her own making. Instead, she trained her mind onto the world around her, taking walks on the beach, collecting beautiful shells, and journaling. Costa Rica has imparted new techniques for coping with stress, which Moss said that she hopes to employ at home.